Welcome to the Election Manager 2016 online manual. 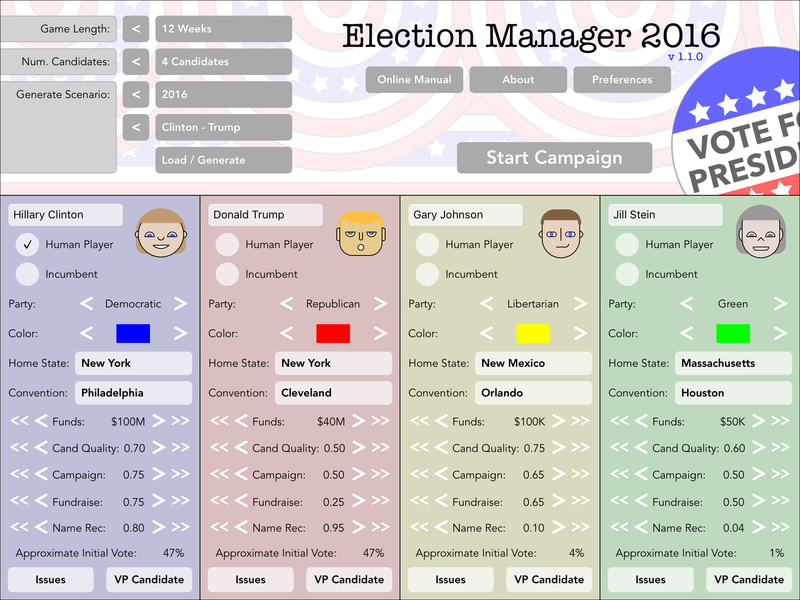 This version of the manual is current for version 1.1.0 of Election Manager 2016. 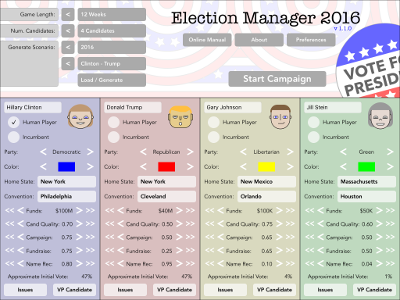 In Election Manager 2016, you are the manager of a U.S. presidential ticket, and attempt to get your candidate elected to office. There are a variety of scenarios, including a recreation of the 2012 presidential election, but almost any scenario can be simulated including competitive third-party or even four-way election scenarios. The main strategic challenge facing the player is that they can't (for the most part) target states directly, but instead must influence states indirectly through the media markets that span them. Even without reading the rest of the manual, it's possible to play the game (essentially) on autopilot by letting your advisor make all of your decisions for you. You can either do that by selecting "Advisor Plan" for all of the options at the start of each week (i.e., for polls, advertisements, offices, and itinerary), or by going to the "Advisor" button on the "National" tab in the game and accepting the AI advisor's suggestions with the buttons on the top of the panel. That said, skimming the Game Concepts section below is recommended to get an idea of what's going on; if not before playing a game or two to get a feel for things, then at some point later. Even after you play a few games and have mastered the game concepts, it's likely you may start the game using the advisor plans as a starting point, or perhaps you might let the AI handle certain things for you and handle other things yourself. There are two basic concepts that affect everything you (and the AI player) does: first, all information is incomplete. Even if you poll every state every week with the most expensive polling option, there's a certain amount of uncertainly built into the results (and if the polls are older, things may be even less accurate as things constantly shift based on the actions the various players make). This uncertainty affects both you and the AI, which will make plans based on the information it has (which may be different than the information you have, but is no more accurate than yours). The second thing is that your most important tool (political ads — but also campaign and fundraising stops) don't target states directly, but media markets. So, despite the ultimate goal is to win enough states to win, the fulcrum you have to do so doesn't map up with them directly. The basic unit of time in the game is the week; each week the players each make a plan, and the plan is executed during the following week until the election itself arrives, at which point there's nothing to do but sit back and watch the results come in. States are ultimately the most important concept in the game. States are worth electoral votes, and whichever candidate can win enough states to get a total of 270 electoral votes will win the electoral college and be elected as president. However (with the exception of State Offices, below), states can't be targeted directly. Each state contains one or more media markets. However, while some markets are entirely contained by one state, many media markets span multiple states; for instance, Pennsylvania contains part of the Philadelphia and Pittsburgh markets (as well as others). Since ads (as well as fundraising and campaign stops), target media markets, this gives the player only an indirect fulcrum for influencing states. There is one exception, however: state offices. These represent a candidate's ground game (i.e., they help with voter turnout), and cost money to maintain (and more money to establish). They also require time to reach full effectiveness, which only make them suitable for long term planning; there's no point in setting up a bunch of state offices during the last week before the election, since by the time they get established and going, the election will already have occurred. Different states require different numbers of offices to be completely effective (depending on the state's size — both population and geographic size). State offices increase a candidate's enthusiasm over time. For the purposes of the game, the District of Columbia is considered a state, since it has electoral votes like any other state. Media markets can be thought of as "cities", although they don't quite match up with actual cities (markets sometimes contain multiple cities) or even metropolitan areas (since collectively they also cover the entire country, including rural areas). Essentially, they're the areas covered by television or radio stations, either directly over-the-air, or areas that television stations would be carried by cable or satellite television providers. Every media market covers at least one state, though many are split across multiple states, for instance a market like St. Louis would cover part of both Missouri and Illinois. Ad buys can be purchased for media markets (the game doesn't really distinguish between television and radio, an ad buy is just the amount of money spent on a market, whatever the details) and will affect voters in a market. Campaign (and fundraising) stops are also in media markets (i.e., in the city a media market is centered in). There are two basic kinds of polls: national tracking polls and state polls. National tracking polls are mostly just flavor — a rough state of the overall election. They can't be commissioned by the player, and ultimately the national vote doesn't really matter and only has a rough relationship with the actual state of the campaign. State polls, on the other hand, can be purchased by the players and are important for planning. Every week media outlets (i.e., the game) will commission a national poll, as well as some state polls (more polls closer to the election, more often for larger states or for states that are closer to being a toss-up). There are three classes of polls, in order of accuracy (and cost): internet polls, robocall polls, and comprehensive polls (representing polls by better polling firms that call cell phones and use larger sample sizes). There are two kinds of ads: national and market ads. National ads target national broadcasts (or in the case of web ads, which are really a type of national ad on the internet). Market ads, of course, target individual markets. Per voter reached, national ads are a little more efficient than market ads, however, many of the voters reached are in areas the player probably can't win (or doesn't have to worry about), so ultimately market ads tend to be more efficient. However, as more money is poured into them advertisements become less efficient for each marginal dollar, so it's best to mix types a bit. Ads come in two other basic types: positive and negative (i.e., pro-candidate or "attack" anti-candidate ads). Positive ads increase both a candidate's enthusiasm and name recognition. Negative ads also increase a candidate's enthusiasm (i.e., the enthusiasm for the candidate that bought the ad) — significantly moreso than positive ads do — but they also increase the enthusiasm of every candidate that isn't the target, and increase their opponent's name recognition as well. For that reason, negative ads are most effective in two-way races when both candidates are already well-known, but counter-productive against candidates that aren't well-known, or when there are more than two candidates that are polling closely. Candidates are the actors in the game. Candidates have various qualities, the first being "candidate quality" itself. Quality is a measure of how good of a candidate the candidate is, i.e., the likelihood voters would want to vote for the candidate (assuming they know who they are and they've been sufficiently persuaded to make it to the polls). Every candidate (both the vice presidential candidate and the top of the ticket) has two skills: campaigning skill and fundraising skill, which are a measure of how effective they are at the two activities (although the vice presidential candidate is half as effective as the headliner at either for the same level of skill for the simple reason that they aren't the head of the ticket). These qualities are fixed once the election starts. During the game, as the campaign manager, you can decide where the presidential and vice-presidential candidates make campaign or fundraising stops. You can also control how many days the candidates prepare for debates. However, how the candidates do at their stops or at the debates is out of the player's control; the best you can do is send them in the right direction and hope for the best. During each party's convention, the candidates will (of course) attend; this is something else you can't control. Beyond that, candidates will also fatigue, requiring the occasional rest day (one day of rest is enough for each week of campaigning). If candidates revisit markets visited too recently (by themselves or the other member of the ticket) subsequent stops will be significantly less effective, depending on how recently they'd visited. This effect only applies to campaigning and campaigning again or fundraising and fundraising again, not doing one then the other; i.e., it actually is a reasonable strategy to campaign in a market then return and fundraise there immediately afterwards. Any time a candidate makes a campaign stop in a market, this will increase the voters' enthusiasm and name recognition in that market. This is a cumulative sort of thing, i.e., if the ticket doesn't have much name recognition to start with, it will be harder to attract media coverage to increase it. Likewise, fundraising is more effective where a candidate is both known and already has a stronger base of support (but is otherwise proportional to the size of the market). Fundraising stops don't otherwise have any effect besides raising funds for the campaign. Candidates will start with a bit more enthusiasm in their home states (more for the presidential candidate than the vice-presidential candidate). This will either happen at the beginning of the game or when a (vice presidential) candidate is selected at the national convention; if the candidate is an incumbent, they will have the vice president available to campaign from the beginning of the game, so the bonus is applied to the vice president's home state then. There are only two factors that can be affected by the player: voter enthusiasm and name recognition. Voter enthusiasm represents how much voters have been persuaded to go out and vote for a candidate, i.e., turnout. Name recognition represents how well-known a player is; voters won't vote for candidates they've never heard of. Relatively high values of both of these are necessary to do well at the polls; neither is sufficient by itself. Both enthusiasm and name recognition can be increased by campaign stops and ads (although attack ads will also affect the values for other candidates, see Advertisements. State offices will also slowly affect enthusiasm in a state over time. Name recognition will always increase. However, over time enthusiasm will slowly decay. There are fifteen issues in the game. Each issue has two positions; for the most part, the issues are equal, although events during the game will increase support for one side or the other, and support for one side of an issue or the other varies from state to state. Issues must be chosen for a ticket before the game begins and can't be changed once the game starts. There is one exception to issue symmetry: being pro-reform on campaign reform will disadvantage a player's fundraising. However, the only campaign reform issue events on either side that ever fire will increase support for the pro-reform side of the issue. So in games where no pro-events fire, being pro-status-quo is a clear advantage, and vice-versa in games where it does. There are various game events that fire during the game that can affect the election. These can increase the support for the particular position on an issue in either a single state or nationally; the effect is described in the news item that will appear at that time. In addition, there are various events that always occur during the game (including, of course, the election itself). The first is the party conventions during weeks twelve through nine (depending on how many players there are, if only two, then weeks ten and nine). If the candidate is not an incumbent, the party's vice-president will be selected and available starting that week (otherwise the vice-presidential candidate is available from the start of the game). The party that has a convention will get an enthusiasm boost that week, particularly in the market with the convention. The other major fixed events are the debates. Any candidates that are sufficiently popular by week seven will be invited; the debates themselves occur weeks five through two (with week four being the vice-presidential debate). Random events can be disabled from the preferences panel (from the top menu or from the startup screen on the Mac, and from the main menu or startup screen on the iPad and iPhone). Some states lean towards one party or another, and some states are harder to influence than others. Some states are also easier for third-party candidates to influence. This is based on actual voter elasticity (and partisan lean) data; for a bog-standard two-way Democratic-versus-Republican contest, with the candidates more or less having the actual party positions, the results of an election will be similar to historical elections. If you swap around the positions, things will get more unstable, with party loyalty clashing with issue preferences. Because of this, even vast amounts of money will only go so far; there are states that are out of reach no matter how much campaigning or ads a candidate buys there (for example, a conservative republican probably can't win DC no matter what, or if they can, they'd win every other state in a landslide), and even if not completely out of reach, some states are easier to defend than others. This is the first control screen of the game where users can load preset scenarios (or create their own). The iPad and Mac versions of this screen are broadly similar, however the iPhone version is slightly different. On the iPad and Mac versions, the main (election) panel and candidate panels are all visible at the same time, on the iPhone, the user needs to swipe to the left or right to navigate between the main election panel and the candidates setup controls. On the first panel (top on iPad and Mac versions, left-most panel on the iPhone version), the game length (12-24 weeks) and number of players (2-4) can be set. A number of pre-set scenarios can also be generated or selected; A "2016 Clinton - Trump" scenario will set up an election like the 2016 election, and a "2012" scenario will set up an election like the 2012 election. Various other scenarios can also be generated (either generic scenarios or one of several hypothetical 2016 scenarios). If generic scenarios are randomized, issues and candidate skills and quality and name recognition will be randomized to various extents. Names, portraits, home states, and convention markets are always randomly chosen when a scenario (other than 2016 or 2012) is generated, however. Note that elections aren't actually set up until the "Load/Generate" button is actually pressed. The bottom panels (on iPad and Mac) or panels to the right (on the iPhone) are for setting up the candidates (to see all of the controls on this panel on the iPhone may require scrolling down depending on screen size). All of the candidate parameters can be set here, from name, appearance, quality parameters, and issues (on the iPad and Mac, you can navigate between various sections via buttons, on the iPhone there's a navigation control at the top of the panel). Any number of players can be played by humans (as long as at least one player is human); during the campaign, the game plays with hotseat multiplayer (the election itself does not involve any player decisions except to see the next state). The incumbent player gets their vice-president from the beginning of the game and has their national convention last. The player's appearance can be changed by clicking the portrait (or touching it on iPad or iPhone). That pops up a dialog that allows you to vary the portrait parameters (or randomize the picture with the dice button). Home state, party, and convention location can also be chosen for an enthusiasm boost for the state or convention location during the location. You can also pick the party's color; this is the color that shows up in graphs and on the map for the party/candidate. The colors are arbitrary and can be changed however the player chooses (say, if the player is colorblind and wants more contrast), it has no effect on game play beyond displaying data and results. Various initial stats can be set for each candidate (and will affect how a candidate performs). The first is candidate funds, which obviously affects how much a candidate can spend on ads and state offices. The next is candidate quality, which affects how likely voters are to vote for a candidate (assuming they know about them or have been persuaded to turn out, and are close enough to the candidate on the issues). The next is campaigning skill, which is how effective candidates are at campaigning. Next is fundraising skill, which is how effective candidates are at fundraising. The next is initial name recognition — how well-known the candidate is among the voters. The issues panel allows the player to select positions for the ticket. These positions are fixed once the election starts. For more information on issues, see the Issues section of the manual. Vice presidents have home states (like the presidential candidate), which they give an enthusiasm bonus for when they are selected. Portraits are modified in the same way as presidential candidates as well, by clicking or touching the portrait. Likewise, vice presidential candidates also have campaigning and fundraising skills. If the presidential candidate is the incumbent, the vice president is available from the beginning of the game. However, if the candidate is not the incumbent, the candidate will show up during the week of the party convention. The vice presidential candidate can then be pre-set with the values here, or if "Select VP at National Convention" is chosen, the player will get a choice of three randomly generated candidates instead. This is the main screen of the game. Again, the iPad and Mac versions are broadly similar, and the iPhone version is laid out a bit differently; this will be covered below. Before each turn, a "Ready, Player!" screen will appear. On this screen the player will have several choices of how to set up their turn. For each set of options (i.e., polls, advertisements, offices, and itinerary), the player can choose to have nothing set up or let the AI adviser set things up for them. In addition, for ads and polls, the player can choose "Same as Last Week" which keep last turn's ad/polling plan (i.e., set up exactly the same plan again this week). No matter which options are chosen, they only set up an initial state; the player can then modify their plans during their turn however they like. If there are any new news items during this week, those will also show up before the player's turn here after plans are initial plans are selected. On the iPad/Mac version of the game, the top bar will show the current player and basic stats for them, as well as how many weeks are left in the game. To the right is the "Finish Turn" button, which will end the player's turn. On the iPad version, there is also a "Menu" button to access the main in-game menu (i.e., to access preferences, to start new games, to see the about screen or load this manual, etc.) — this replaces the standard top menu bar on the Mac version. On the iPhone version, the status is split between the top and bottom bars; the "Finish Turn" button is on the top, and the in-game menu is accessible from the bottom control bar. On the iPad/Mac version of the game, the main map is found on the bottom left of the screen (on the iPhone version, the map is collapsed into the bottom control bar, and available from the left-most tab). The map shows states and markets (assuming they're displayed; see below), these can be selected on the map. On the bottom left is a graph for the currently selected state and market, showing the components of that state or market. To the bottom right are controls to navigate on the map; users can also navigate by dragging the mouse (Mac) or dragging the screen (iPad, iPhone), or can zoom in and out with the scroll wheel (Mac) or by pinching (iPad, iPhone). 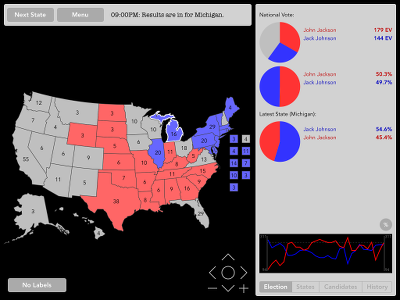 Along the top left of the map are controls allowing the player to change the display; the choices for the states are "Base Map" (i.e., no colors), "Poll Results" (which shows the most recent poll results for each state and colors the state with the candidate who is leading, or grey if there is no polling for that state), "Poll Age" (which shows how recently a state has been polled — darker is more recent, gray is no data), "Office Effectiveness" (which shows the current effect of your offices, darker for greater, gray for none), "Offices" (which shows how many offices a party has in each state, darker for more, gray for none), and "Support" (which shows how much support parties have from state to state, again, darker for stronger support, gray for none or no data). The next button controls how markets are displayed: "Hide Markets" (should be obvious), "Show Markets" (shows markets but doesn't color them), "Advertising" (colors markets based on ad spending, darker for greater, dark gray for none), "Last Visit" (colors markets based on how recently any of the player's candidates have visited them, darker for more recent, dark gray for never), and "Last Fundraising" (colors markets based on how recently any of the player's candidates have visited them for fundraising, again, darker for more recent). To the top right is a button that toggles the display of state codes and electoral vote values for each state. On the iPad and iPhone version of the game, double-tapping will zoom in on the map, and triple-tapping will reset/recenter the map. The National (Nation on the iPhone) tab shows top-level information (i.e. a tracking graph and basic budget numbers) and can be used to set national ad spending (web ads are really just a cheaper form of national ads that target the web rather than television stations). This (and the other tabs from the following sections) are available in the side panel (on the Mac and iPad) or from the bottom control bar (on the iPhone). For the tracking graph, the "EV" or "%" button can be used to toggle between popular vote and electoral vote tracking. For more information on the effect of various advertising options, see the Advertisements section above. For the buttons at the bottom of the panel ("Ad Planner", "Poll Planner", "Itinerary Planner", "Advisor", "Budget Summary", "Top Stories", "Ad History", and "Poll History"), see the the appropriate Sub-Panels section below. The Candidate (Cand on the iPhone) tab shows current player information. Tickets can be cycled through with the arrow buttons to the left and right. The "Show Platform" or "Show Ticket Info" will toggle between a display showing current candidate/ticket information and showing the platform positions on each of the issues. For more information on the candidate skills and status, see the Candidates section or the Enthusiasm and Name Recognition section above; for more information on the issues, see the Issues section. For the other buttons at the bottom of the panel ("Itinerary Planner" and "Campaign History"), see the the appropriate Sub-Panels section below. The Market tab shows information on the currently selected market. The market can be selected with the menu bar at the top of the panel (it can also be selected by clicking or or touching market circles on the map, which will automatically navigate to the market tab as well on the iPad or Mac). Underneath the selector is a list of states and the portion of the market that is in each state; these state names can also be selected to navigate to the given state. Other information is also available, such as the total size (population) of the market, and the last time your candidates visited it. From this panel the player can also plan advertising and candidate visits (and specify if a visit is intended for campaigning — i.e., increasing the candidate's exposure — or for fundraising — i.e., purely to raise money); for more information on advertising options, see the Advertisements section above. For the other buttons at the bottom of the panel ("Ad History" and "Campaign History"), see the the appropriate Sub-Panels section below. The State tab shows information on the currently selected state. The state can be selected with the menu bar at the top of the panel (it can also be selected by clicking on or touching the states on the map, which will automatically navigate to the state tab as well on the iPad or Mac). Underneath the selector is a vote tracking graph as well as the latest polling results. Beneath that is a list of markets found in the state, as well as how much of the state falls in that market. Market names can be selected to navigate to the given market. At the bottom of the panel the player can commission state polls (see the Polls section above for more information on polling options), and see the current status of state campaign offices. For the other buttons at the bottom of the panel ("Manage Offices" and "Poll History"), see the the appropriate Sub-Panels section below. 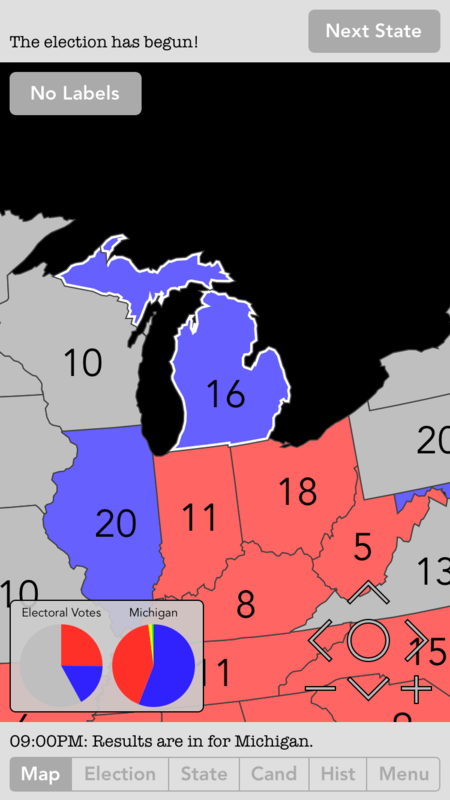 The Electoral Vote value of the state is displayed in the bottom left. The ad planner panel can be used to plan or view large numbers of market ads at the same time based on the state filter/options chosen at the top of the panel. The first selector is used to filter on a state you'd like to target, and the next two selectors control the type of ad that can be applied to all the markets in the filtered state with the "Apply to Markets" button. If no state is selected (i.e., all states are selected), the ad type/level can be applied to every market in the country at once. Markets can be selected by clicking or touching the market names on this screen; the map will then zoom to that market (though you'll have to change tabs to see that on the iPhone). The ad planner panel is available from the National Tab. The poll planner panel can be used to plan or view your polling strategy based on the state filter/options chosen at the top of the panel. The first selector is used to filter on a states you'd like to target (based on the various options available), and the next selector controls the type of poll that can be commissioned for those states with the "Commission Polls" button. If no filter is selected (i.e., all states are selected), polls can be commissioned (or canceled) for every state in the country at once. States can be selected by clicking or touching the state names on this screen; the map will then zoom to that state (though you'll have to change tabs to see that on the iPhone). The poll planner panel is available from the National Tab. The advisor panel shows what your AI advisor suggests is a reasonable plan, as well as whether your current plans match the AI advisor's plans. If the current plan for the upcoming week differs from the AI's suggestions, you can apply the AI suggestions with the buttons at the top of the panel. The various sections of the plan (i.e., polls, advertisements, state offices, and itinerary) can be expanded or collapsed with the buttons at the top of each section. Once expanded, you can get an idea of where they states and markets listed here are by clicking (or touching) their names on this screen; once you do that, they'll be selected on the map (though you'll have to change tabs to see the map on the phone). You can also reject (or accept) specific parts of the advisor's plan with the buttons on the right side of the panel. The advisor panel is available from the National Tab. The budget summary panel shows the current state of the player's budget, as well as how much funds have been raised during the last week and also how much the current campaign plan will spend on various different activities during the next week. The budget summary panel is available from the National Tab. The top stories panel displays the news stories that have occurred over the course of the election; any of the news stories can be re-displayed by selecting the story headline. The top stories panel is available from the National Tab, as well as the Election History Tab tab. The itinerary planner panel allows the player to plan the campaign and fundraising stops for the ticket's presidential candidate and vice-presidential candidate (if the vice president has been chosen and is available yet). For each day of the week, the player can visit a market or rest; if the candidate chooses to visit a market, it can be set up as a campaign stop or a fundraising stop with fundraising checkbox (for more information on the difference between fundraising and campaign stops, see the section on Candidates above). In addition to the market visits, during certain weeks other special options will be available (i.e., debate preparation) or certain days will be blocked off for special events (i.e., debates or party conventions). The itinerary planner panel is available from the Candidates Tab and the National Tab. The manage offices panel allows the player to manage the state campaign offices for each state. Offices can be opened (or if the ticket is short of cash, closed). Note that offices take time to get established (several weeks to reach peak effectiveness), and cost more to set up than maintain. The information here allows you to see how effective the offices will be, and what the other players are doing as well. The manage offices panel is available from the States Tab. The ad history panel displays all the advertisements that have been run during the campaign so far or are currently being planned by the current player for the current week. The ads can be filtered both by market (or can be filtered to show national ads, or all ads on the Mac) and by ticket (or all tickets). For each ad displayed, both the party that bought the ad and the target of the ad is shown both by color and party abbreviation. The ad history panel is available from the National Tab or the Markets Tab, as well as the Election History Tab tab. The poll history panel displays all of the polls that have been run so far during the election, as well as polls that are being planned by the current player for the current week. 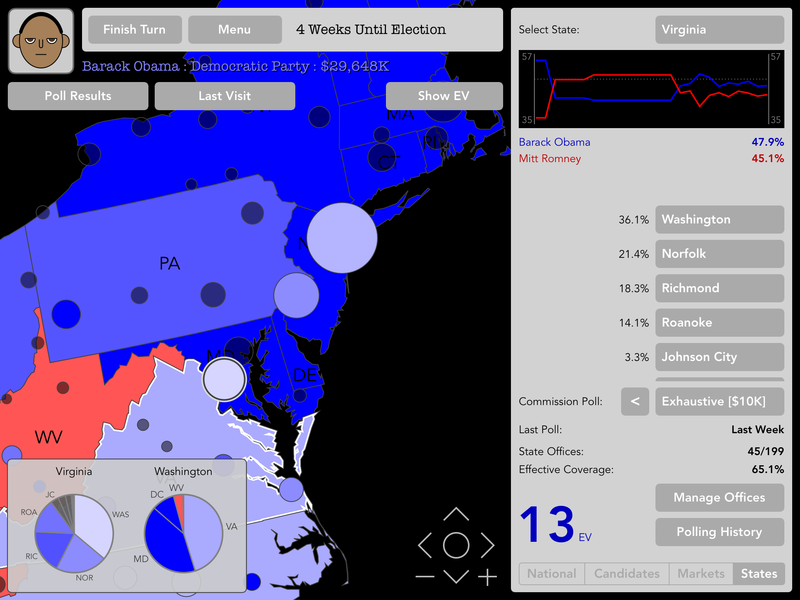 Polls can be filtered by state, or national polls can be displayed, or all polls on the Mac. For each ad displayed, the type of ad is shown after the state ("I" for internet, "R" for robocall, or "E" for exhaustive; see the Polls section for more information on polling types), as well as the poll results (by color and party abbreviation), assuming the poll has been run. The poll history panel is available from the National Tab or the States Tab, as well as the Election History Tab or Election States Tab tabs. The campaign history panel allows the player to see all of the campaign activities of each of the candidates (i.e., what each of the candidates have done each day of the campaign so far, and where they've done it). The party ticket can be filtered at the top of the panel (or all parties can be shown at once); note that if it's still the first week of the campaign, no activities will have yet taken place so the panel will be empty. The campaign history panel is available from the Candidates Tab or the Markets Tab, as well as the Election History Tab or Election Candidates Tab tabs. Once the campaign finishes and the election begins, the campaign panels are replaced by the election panels to show the election results. At this point, there are no player turns as there is no longer anything to control (beyond showing the next state or looking through the results and other history, anyway). The top bar will show the latest election information, and allows the player(s) to display the results from the next state when the "Begin" or "Next State" button is selected. As with the main campaign screen, a "Menu" button is available on the iPad version to access the main menu, and the iPhone version again splits status on the top and bottom (and has a "Menu" tab at the right end of the bottom control bar). On the iPad and Mac, the map is displayed at the bottom left; on the iPad the map is accessible from the left-most tab of the bottom control bar. This panel shows which states have been called for which candidates. Any of the states can be selected, and at the bottom left (iPad/Mac) or top left (iPhone) of the map, a button will cycle through showing electoral votes, state abbreviations, or nothing at all. There is also a navigation panel at the bottom right; the map can also be navigated by dragging it, or zoomed in and out with the scrollbar (Mac) or by pinching it (iPad, iPhone). There is one significant difference between the iPad/Mac version of the game and the iPhone version: on the iPhone, since it's not possible to display both the map and the election tab at the same time (see next section immediately below), there's a small display panel at the bottom left of the map display that shows pie graphs of the current electoral vote totals and the most recent state vote results. The election tab shows the current overall state of the election; it displays national vote (both electoral votes on top and popular vote below), and the voter results from the most recent state called. At the bottom of the tab is the historical graph from the tracking polls. The "%" or "EV" button will toggle between national popular vote and electoral votes. This and the following tabs are available from the panel on the right side of the screen on the iPad and Mac; on the iPhone, these tabs are combined with the map and menu tabs in the bottom control bar. The states tab shows voting results for a given state (assuming the state has been called, otherwise the information will still be blank). It also shows electoral votes for the state between the state voting results pie graph and the winning candidate's portrait. At the bottom of the screen is the number of offices in the state, as well as the tracking graph for the state. Finally, states can be selected with the selection button at the top of the panel (or by selecting states on the map). At the very bottom of the panel is a "Poll History" button, see the the appropriate Sub-Panels section above. The information on the candidate tab (cand tab on the iPhone) here is identical to the information on the Candidates Tab (minus the itinerary planner panel) during the campaign. See that section for more information. The history tab (or hist tab on the iPhone) shows the results from each state (as well as overall national results) in tabular form. In addition, the following buttons are available at the bottom of the panel: "Top Stories", "Campaign History", "Ad History", and "Poll History". All of the panels in the election results screen are the same as those available during the game, see the Sub-Panels section above for reference. Once the game finishes, a screen will pop up and display the winner (if there is one) and some graphs of how the election went, including electoral votes, national popular vote, states won, and each candidate's final budget (the money raised during the campaign is in a darker color to the right). At the bottom of the panel are two options: you can either return to the map/game (if you'd like to dig farther into the results and other information) or immediately start a new game. I've had an election game percolating in the back of my head for quite a while now; I actually wrote a much simpler earlier version of this game many years ago (in [incr TCL] of all things — there's an obscure language for you). The key concept in this game, though, is something that I only considered more recently — the concept of de-coupling states from media markets. It's obviously one of the key concepts in the the game, and the aspect that gives the game a fair amount of its strategic depth. I suppose the fact that this game exists at all is due to the fact that I needed to get it out of my system — it's certainly not a whole lot like my previous game, and probably won't be much like any other games I create down the road. Clearly there are a lot of things that have influenced this game, including many years of reading sites such as Nate Silver's 538 Blog (now an independent site — I don't follow it as much as I used to, though), Sam Wang at the Princeton Election Consortium, or electoral-vote.com (which was my introduction to polling aggregation sites ten years ago or so. Another bit of trivia — the creator of that site, Andrew Tannanbaum, is better known for some pretty good computer science textbooks — including one of mine in college twenty years ago). And too many other sites to mention or even remember. None of these really had any direct effect on the game per se; they've influenced me over the years as an election observer in general but I've been interested in presidential elections for a lot longer than any of those sites — or even the web — has existed (my previous game predates those sites — possibly even electoral-vote.com — and I've been playing election games even longer than that. My dad even wrote a simple paper-based game when I was still a kid — it had squares with red on one side and blue on the other, back when red made more sense for Democrats and blue for Republicans for more people than just me). So, a lot of things that went into the game probably seem pretty obvious: i.e., partisan leanings for states and so forth. By necessity, pretty much every election game has something to model that. Voter elasticity is a bit more obscure concept, but not difficult to understand: that is, some states contain more (actual) independent voters than others and are easier to influence. And the dichotomy between media markets and states, as I touched on above. Astute observers, however, will notice that I made one major simplification from how presidential elections actually work (or at least have recently): I turned both Maine and Nebraska into "winner-take-all" states. I did this because (1) the game is just simpler to code and display that way (mostly in terms of interface, but also in terms of the engine) and (2) those divisions seldom make any actual difference to election results. By which I mean it's been rare that those states actually split their vote (it didn't happen in 2012 and it's probably unlikely in 2016, though we'll see), and when and if they do, it seems unlikely that it would happen in a close election in the first place. That said, I may patch that into the game in a future version; we'll see. One of the things that was important to me is not that the game is "accurate" per se, but that the results are plausible without being deterministic. And that results can be influenced by the player without resulting in ridiculously unbalanced results. I hope I've achieved that. If I have, I've done it with a small amount of randomness and just through the uncertainty inherent in the noise that not-completely-accurate polls give you. So the election results will always be a bit — but not excessively — surprising. I also think that an election game should not really have an editorial stance. In that I mean that I wanted the results from the 2012 scenario to come out approximately like the actual election did (I mean, that's history), but if you want to level the playing field (or give the edge to Romney), feel free. The game won't judge, simulate whatever scenarios interest you. Personally, I most enjoy playing third-party candidates and I suspect many players will, too. I also fully intend to add a 2016 scenario when that election comes around, and model it to return approximately the results the actual election has. One of the really enjoyable things for me was working on the game map (or maps — the detail actually scales depending on how far you're zoomed in). I used to work (professionally) doing mapping/GIS programming, and it had been a while since I'd done that in my day job. I really did miss it a bit and tweaking the basemaps was actually a lot of fun. I've actually open-sourced the RGeo/Geos code I used to get the various simplified maps (for various zooms) on my github account here, so feel free to take a look if your interests happen to run along those lines. So, as a political junkie (and not just American politics, I keep up on a fair amount of international politics as well) and having had a life-long love of maps, really, how could I resist writing this game? Anyway, I hope you enjoy playing it, too. If you've gotten this far, a hint: in the setup screen, when you edit the candidate portraits, try setting the candidate's hair color to blond, then make them bald with no facial hair. Then cycle through the head shapes. If any of the active candidates have one of the, ah, special portraits and random events are enabled... Interesting things will happen.